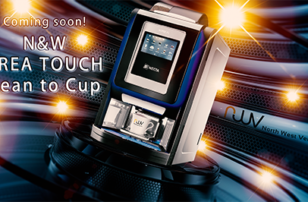 From the home of espresso comes the new Evoca Kalea, barista style drinks made with ease at the touch of a button. Characterized by contemporary and elegant Italian design, the Evoca Kalea has compact dimensions, stylish accessories and an eye catching seven inch touch screen menu. The Kalea is the result of Evoca’s decades of coffee-machine expertise, with step-less height-adjustable coffee/milk dispense you can use all popular sizes of cups up to 12oz. An extensive and customizable menu offers frothy cappuccinos, creamy lattes, intense espressos and chocolate based drinks, quickly served and consistently. 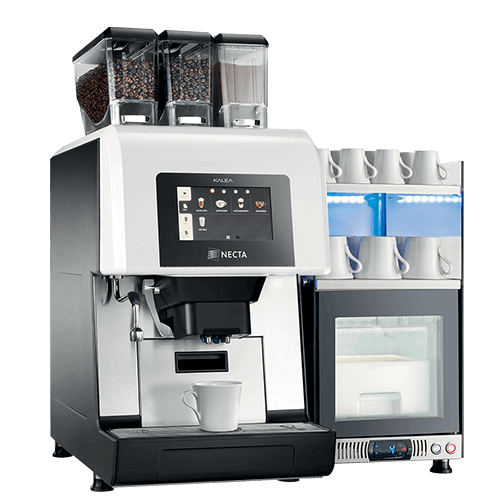 The Necta Kalea makes achieving optimum hygiene easy with an integrated automatic or programmable rinsing, cleaning and descaling programme for both coffee and milk unit. The dispense head is easy to dismantle and clean. Keeping up to 2 litres of milk fresh at a constant 5°C, the optional fridge is a worthy addition. The milk container is easy to refill and can be removed for cleaning. An optional matching cup warmer completes the picture. Call us to order.